Remember when we went to the Yucatan a few weeks ago and I ate chilaquiles everyday for breakfast because I admittedly have a problem? Well, I also ate salad, I promise. I ate a lot of good food as you could imagine. I had never been to the Yucatan peninsula before. As you may know I was born in Mexico and spent many Summers there growing up with the most amazing food in the world, or at least I think so. Growing up there, I also knew food was very regional. A tamale in Torreon, where I am from, is not the same in Southern Mexico, or even the Yucatan. Mole differs from region to region, as do the fruits and vegetables. 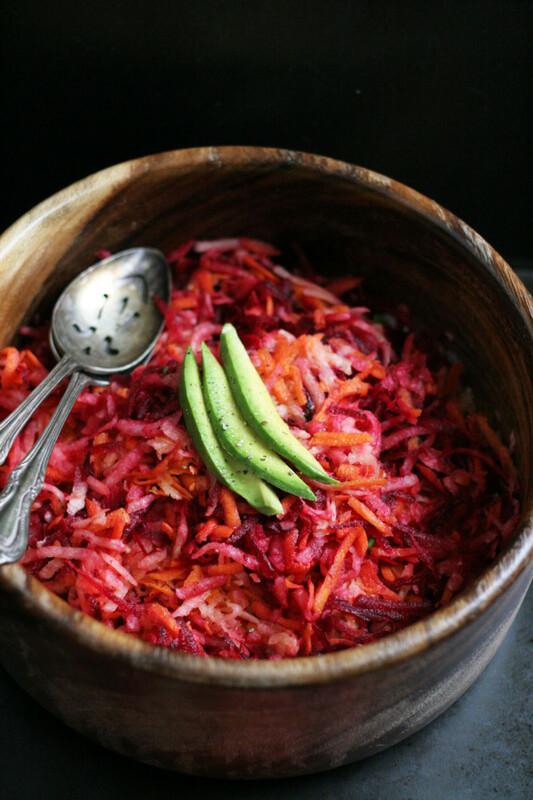 This salad is very popular in the Yucatan where the soil boasts beautiful root vegetables like jicama, carrots, and beets. The resort where we stayed was in the jungle, straight up, no joke jungle. We were about forty minutes South of Cancun on the coast at an Eco friendly resort that kept the jungle in tact, wildlife and all. So you could imagine the food. They harvested and grew many of the fruits and vegetables from the property. Not unlike this beautiful and simple root salad. They had a restaurant in the middle of the jungle, monkeys playing on the palapa roof, open air type jungle. Wild cats, giant duck type things walking right up to us, it was awesome. They had excellent regional food there, so we ate there often to try all of the menu. Each meal I would order the fruit plate and a different salad. I was super inspired by a similar root salad I ate one day, of course I wrote it down. 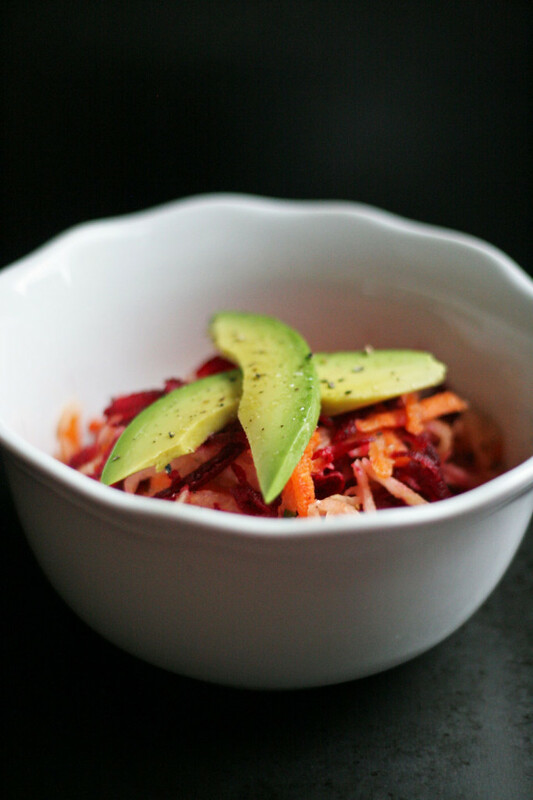 A simple regional root salad with carrots, beets, and jicama to drool over. Earthy, sweet, and crisp. The perfect accompaniment to near one hundred percent humidity and hot days in that jungle. It was refreshing, light, and so good. I simply wrote down root salad to make myself remember the flavors, I don’t this often, I am usually a bit more described. But this one needed to be simple, so I wrote root salad. Here is my take on the gorgeous dish. Do you like roots? Oh and by the way, this will go perfectly with whatever you plan on grilling for the Fourth of July festivities! Also, I’ll be sharing an amazing recipe for brick grilled chicken this Thursday, so I’ve pretty much got your menu covered. Note: I used a box grader, large side, to grate the vegetables. You could also use a food processor, or mandolin. 1. 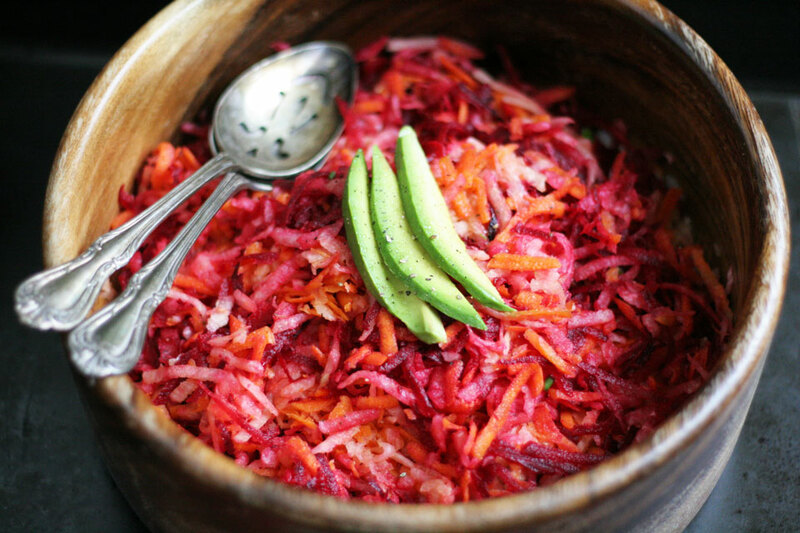 In a large bowl, combine the jicama, carrot, beet, chives, lime juice, olive oil, salt, and peeper. Toss gently to combine. Adjust seasoning if necessary. Serve cold with sliced avocado. Store in an airtight container for up to 2 days. Best served fresh the day it is prepared. I love jicama and it’s crunchy, earthiness. Do you like jicama? Have you tried my other jicama salad with peach? It’s pretty tasty! Also, check back on Thursday, I am sharing a Brick Grilled Lime Chicken recipe, great for your weekend celebrations! Looks amazing! Would love to make this . 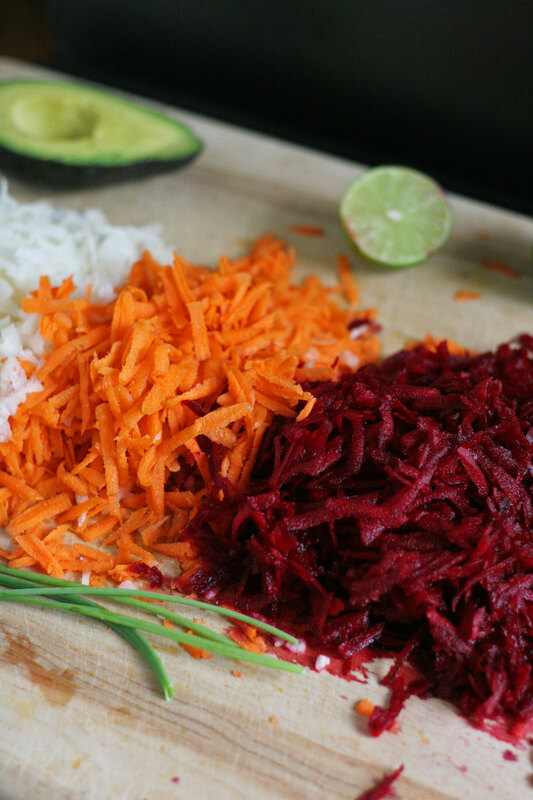 Here’s the question… Do you cook the beets or just peel them uncooked? Hi Susan! Thank you so much, I hope you love this salad, it’s super easy to put together. The beets are raw, so makes it even easier! Let me know what you think. Have a great weekend! Thank you sweet lady! I hope you are well, hugs!! !